By News Reporters The Charlotte Street Association, the longest-running campaign group in Fitzrovia, are to hold their annual general meeting on Tuesday 14 May. Now in their forty-third year, they comment on planning and licensing applications and campaign for more affordable housing, open space and environmental improvements in Fitzrovia. 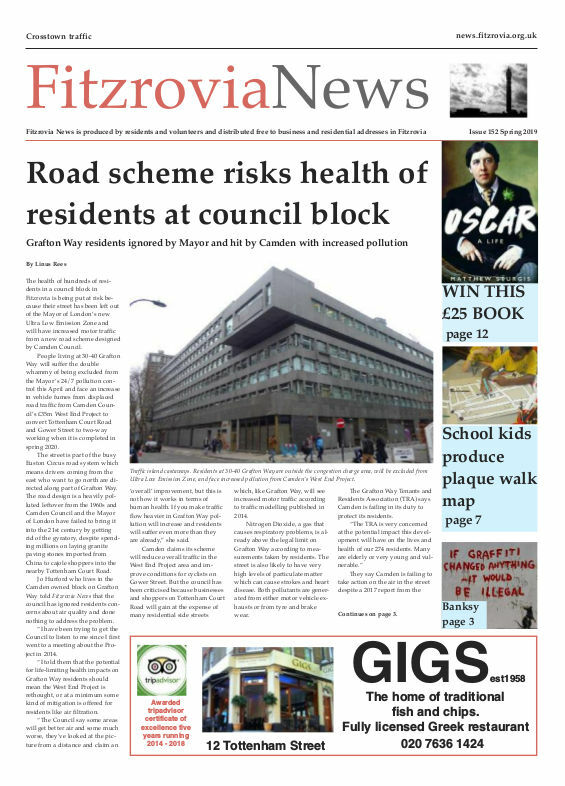 They initiated the Fitzrovia Area Action Plan currently being developed with Camden Council. At this year’s annual general meeting, which will be held for the first time at the Fitzrovia Community Centre, they will be holding a discussion about the proposed changes to the Tottenham Court Road and Gower Street one-way system. Camden Council is proposing to introduce a 2-way traffic system on both roads and other changes to the roadways. The one-way system has been in operation since the 1960s. Charlotte Street Association annual general meeting, 7pm Tuesday 14 May 2013, Fitzrovia Community Centre, 2 Foley Street, W1W 6DN. Anyone who lives or works in Fitzrovia is welcome to attend.